Ministry of Corporate Affairs (MCA) amends incorporation rules and introduces Form no. INC-20A for declaration at the time of commencement of business by a Director vide amendment to the Companies (Incorporation) Rules, 2014. Every Company Incorporated in India on or after 02nd November, 2018 and having a share capital is mandated to obtain commencement of business certificate before commencing any business or exercising any borrowing powers. The MCA inserts Rule 23A which makes mandatory for the directors to submit a declaration at the time of commencement of business under Section 10A in Form no. INC-20A in accordance with Companies (registration Offices and Fees) Rule 2014. The rule specifies that registration or approval (if any required) from any sectoral regulators such as RBI, SEBI etc should be obtained and attached with Form no. INC-20A. Promotors of the company should deposit the share subscription money in the bank account. No waiting for opening of bank account. Deposit share subscription amount in company’s bank account. File form INC-22 for verification of registered office. File form INC-20A maximum within 180 days of incorporation of company. The content of INC-20A is further required to be verified by the Company Secretary (CS), Chartered Accountant (CA) or a Cost Accountant in practice. 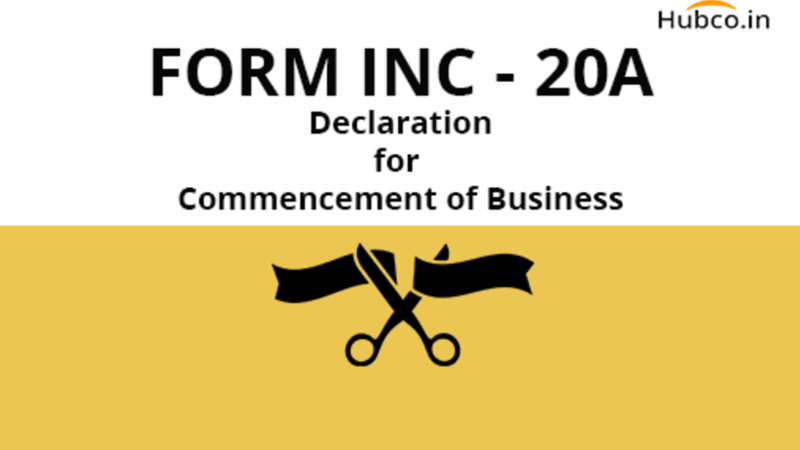 Form INC-20A is to be filed within 180 days from Incorporation of the company under which each director has to declare that every shareholder has paid the value of the shares agreed to be taken by him/her on the date of the making of such declaration in the company's bank account. On Company: Any company that does not obtain commencement of business certificate within 180 days of incorporation will be liable for payment of a penalty of Rs.50,000. On Directors: Each of the Directors who have defaulted would be liable for payment of a penalty of Rs.1000 per day of default upto a maximum of Rs.1 lakh. Strike off: Registrar has reasonable cause to believe that the company is not carrying on any business or operations, he/she may initiate action for the removal of the name of the company from the register of companies. We have tried to cover all the aspect of these rules, and would also able to help companies in managing their compliances in the best possible manner. We are a team of CA's and CS which can help businesses in their smooth functioning, and in case, you find any difficulty and have any questions do reach out to us on info@hubco.in.